A nanozyme-linked immunosorbent assay is described for cardiac troponin I which is a biomarker for myocardial infarction. The method is based on the use of Pd-Ir nanocubes with excellent peroxidase-like activity. The nanocubes catalyze the oxidization of nonfluorescent o-phenylenediamine (OPD) by H2O2 to form a yellow fluorescent product (oxOPD) with excitation/emission maxima at 400/570 nm. Carbon dots are added as a reference fluorophore. Under the same excitation wavelength, they display blue fluorescence (450 nm). The ELISA uses the Pd-Ir nanocubes as a label for the secondary antibody and OPD as substrate. The ratio of fluorescence intensities at 570 and 450 nm increases in the 1 pg·mL−1 to 1 ng·mL−1 cardiac troponin I concentration range, and the detection limit is 0.31 pg·mL−1. 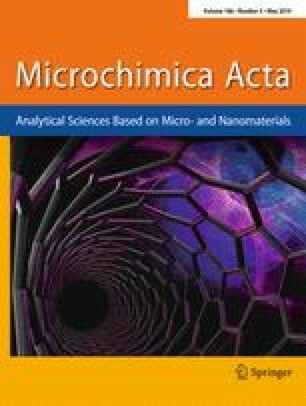 The method was applied to analyze spiked serum samples, and the results compared well with those obtained by a commercial chemiluminescence assay. Schematic presentation of the ratiometric fluorescence immunoassay for cardiac troponin-I. 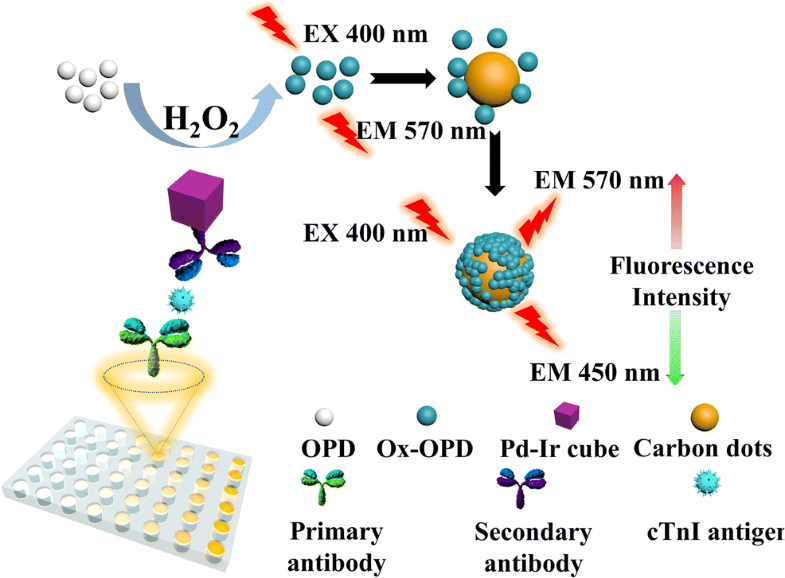 Pd-Ir nanocubes were employed to fabricate nanozyme-based signal labels for its excellent peroxidase-mimicking activity. Xiaofeng Tan and Lianhua Zhang contributed equally to this work. The online version of this article ( https://doi.org/10.1007/s00604-019-3375-z) contains supplementary material, which is available to authorized users. This study was supported by the Natural Science Foundation of Shandong Province, China (No. ZR2017MB017) and the Natural Science Foundation of China (No. 21245007 and 81000976).